Combine corn syrup, brown sugar, and butter in saucepan. Cook over medium heat until it boils. Pour over Rice Krispies. Stir together and then press into a buttered pie plate. Mix all the topping ingredients together and spread half on top of the pie crust. Spread softened ice cream on top of crust. Spread remaining topping over ice cream. Freeze for 2 - 3 hours. If desired, garnish with chopped peanuts just before serving. You can make extra topping and pile it on thick. It's up to you. 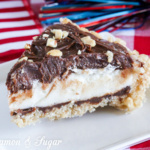 *Hershey's Chocolate Syrup in a can works well with this recipe. If you use hot fudge sauce, your topping will be thick and more difficult to spread, but it will still be delicious! If you find the topping is too thick to spread, add an additional tablespoon or two of corn syrup. If ice cream is too soft to spread the topping, freeze at least 60 minutes then add topping.